Need some shade in your garden, a place to cool off, somewhere to read the newspaper? A parasol lets you linger over a meal, enjoying the pleasure of eating outside without the sun beating down you. Relax and snooze in the cool of your garden with a sturdy parasol and parasol base. Our brightly coloured parasols let you take shelter on a sunny day and filter out the harsh rays. Retreat from the glare of the day and enjoy the simple, clean, classic lines of our carefully edited selection of parasols. Weather-proof, they can withstand a light shower, wicking moisture and drying quickly, though we do recommend they are taken down in strong winds. They have fibre glass spokes and a crank handle, making them easy to put up and down. There is a choice of sizes, with the 2.5 metre size ideal for most 4 – 6 seater tables. Our parasols are carefully chosen to co-ordinate with our seat cushions. They are made of fast-drying waterproof acrylic and available in a choice of colours – terracotta, blue, green or stone. 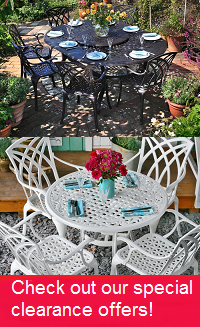 You can also purchase a cast iron parasol base in either antique bronze or white. These are fairly hefty, help withstand windy conditions and ensure that your parasol does not fly away! If you would like to discuss our parasols or bases, then please call our friendly team on 01243 71 71 97.